On October 4, after an incredibly successful theatrical re-release, The Lion King will debut on hi-def home video...and you can win a copy of your own from The Mouse Castle! 1. Visit The Mouse Castle Facebook page at www.facebook.com/themousecastle and become a fan (click the "Like" button, if you haven't already). 2. 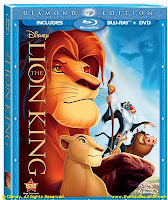 Find the event "THE LION KING: Diamond Edition Blu-ray Combo Pack Giveaway." 3. Confirm that you will be attending this event. Get your entry in no later than October 11, 2011 at 5:00 p.m. Pacific time. You must be a resident of the United States to enter. Only one entry per person, please. Remember, you must "Like" The Mouse Castle on Facebook and RSVP for the giveaway event by clicking "I'm Attending" (mobile Facebook users may see a button labeled "Confirmed" or similar). Sometime after the entry deadline, I will draw one winner at random. The winner's name will be posted on The Mouse Castle Facebook page. Good Luck and Hakuna Matata! For the last two weeks, The Lion King has ruled at the box office. It took in over $22 million just this past weekend. As its theatrical re-release comes to a close, it'll gear up for a hi-def, 3D home video release on October 4. 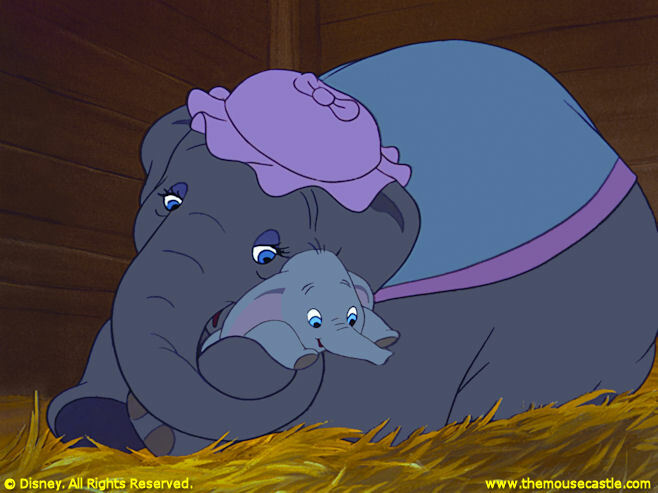 Almost lost amid the hoopla surrounding the second coming of Simba, however, is the comparatively quiet debut of Dumbo last week on Blu-ray. Marking its 70th anniversary this year, this simple story of the put-upon baby elephant with over-sized ears who learns he can fly finally gets the restoration and treatment it deserves. It's a bright and beautiful presentation of one of Walt Disney's most perfect and emotionally satisfying films. Ironically, Dumbo and The Lion King share a similar pedigree. At the time they went into production, both films were considered secondary projects (Bambi and Pocahontas being the "prestige" pictures at the Disney Studios at their respective times) and were animated to a large extent by younger, less experienced artists. They were each also released near the tail end of a "golden age" of Disney animation. Dumbo followed in the footsteps of Snow White and the Seven Dwarfs, Pinocchio and Fantasia. The Lion King came on the heels of The Little Mermaid, Beauty and the Beast and Aladdin. Both films have more than stood the test of time and are unquestionable Disney classics. 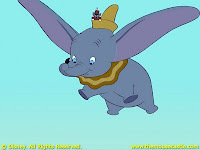 But, since Dumbo came first, let's shine the spotlight on it today. Mrs. Jumbo and her "Baby Mine"
It would be easy to dismiss Dumbo as a minor entry in Disney animation. After all, it's the most cartoony of Disney's pre-WWII feature films. It wasn't groundbreaking like Snow White and the Seven Dwarfs. It didn't have the visual depth and detail of Pinocchio. It certainly lacked the ambition of Fantasia. At 64 minutes, you could barely even call it feature length. It was a movie pressed into production quickly to generate cash flow for the studio, an atypical, but necessary move at the time. Pinocchio and Fantasia were both expensive films that performed poorly at the box office and European distribution had all but dried up because of the war, cutting off a significant revenue stream. Walt Disney needed a movie U.S. audiences would respond to favorably. He needed a hit. "(Dumbo was) one of the cheapest films we ever made. It came in for around $950,000 which was damn reasonable, even for 1940, when our cartoon features like Bambi climbed into the $2 million or $3 million bracket. The reason we brought it in for a low price was that it was done quickly and with a minimum amount of mistakes. The story was clear and air-tight to everyone involved in the project. We didn't do a lot of stuff over due to story-point goofs. There were no sequences started and then shelved, like in Pinocchio. Walt was sure of what he wanted and this confidence was shared by the entire crew. Dumbo, from the opening drawing, went straight through to the finish with very few things changed or altered." Dumbo was released on October 23, 1941 and was immediately embraced by moviegoers and critics alike. People responded to the film's universal themes of feeling alienated for being different and triumphing in the face of adversity. So popular was Dumbo, that Time Magazine planned to put the aerodynamic elephant on its cover. When the Japanese bombed Pearl Harbor in December 1941, however, Time chose to go with a more pertinent cover instead. Dumbo ran the gamut of emotions, from the whimsical fun of Casey Jr.'s train trek through the countryside to the tear-inducing "Baby Mine." It also has the sublime surrealistic invention of "Pink Elephants on Parade," Dumbo and Timothy Mouse's hallucinatory observation after drinking water spiked with champagne. For sheer originality (and having one of Disney's catchiest melodies), it ranks among the greatest scenes in the history of animation. Clever, funny and heartfelt, with colors exploding off the screen in Blu-ray, Dumbo is a must-have for your Disney video library. Last week, I posted an interview with Disney animator Tony Bancroft about his work on The Lion King. This week, Tony shares with us how he animated the jovial warthog Pumbaa. Enjoy! It's tough to make an ugly, smelly creature with spindly legs into a funny animated character that audiences love. Tony Bancroft managed to do that when he was the supervising animator for the flatulent, fun-loving warthog Pumbaa in The Lion King. The 1994 animated classic begins a two week theatrical run this weekend in an "enhanced" 3D version (for purists like me, the movie is being show in 2D as well) and will be released on Blu-ray and Blu-ray 3D on October 4. 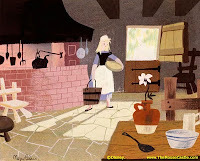 Bancroft attended CalArts beginning in 1987 and eventually spent 12 years at Disney, animating films including Beauty and the Beast, Aladdin and The Emperor's New Groove. He also co-directed Mulan with Barry Cook. Even with that diverse resume, Pumbaa keeps a special place in Bancroft's heart. "I think it was because he was my first character to supervise as an animator," he says. "Also, he and I have so much in common. We're both overweight and enjoy a good bug every once in awhile!" 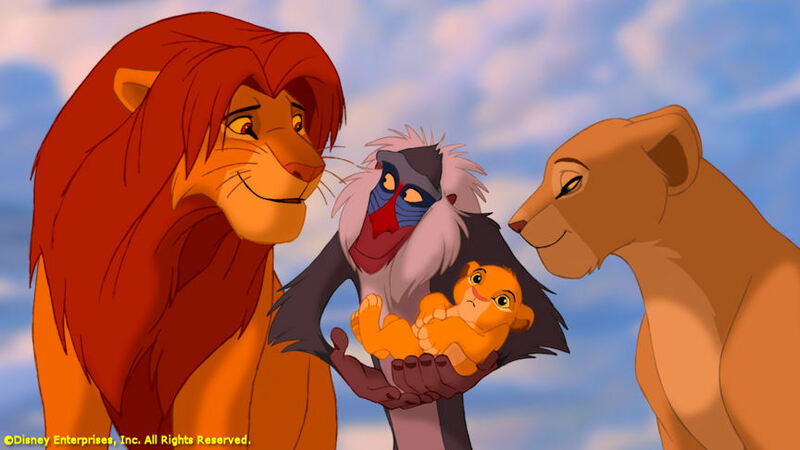 When The Lion King first went into production, it was considered a secondary project. Following the successes of The Little Mermaid and Beauty and the Beast, the Walt Disney Studios was far more excited about making another film with a strong female protagonist, Pocohontas. There wasn't nearly as much enthusiasm for a "King of the Jungle" (The Lion King's working title) film. So, veteran animators were assigned to Pocahontas while, for the most part, less experienced staff was put on The Lion King. Says Bancroft, "Many of us on The Lion King were young animators that just had no fear of trying new things and we were totally focused on making great films. There was not a lot of pressure on us at the time because the studio did not expect much from The Lion King at first so we felt creatively unharnessed." In the beginning, Bancroft was drawn to the character of Zazu, Mufasa's horn-billed major domo. As he explains, "Pumbaa and Timon, even at an early stage of the film, were the break out popular characters and they seemed out of my reach to even request as a first-time supervising animator. Having just finished animating Iago, the parrot from Aladdin, I thought, 'Well, Iago's a bird and Zazu's a bird. Maybe I have a shot.' I was totally taken by surprise when the directors called me to offer me the character of Pumbaa. It was one of the happiest day of my life." It took time to make a warthog an appealing character, though. With his fellow animators, Bancroft made trips to the zoo and even observed and drew animals brought into the studio. "I spent a good six months just coming up with the design. What does he look like? How do we make one of the ugliest known animals in the animal kingdom appealing for the audience? So, we spent a lot of time trying to hone that design into something that's simple, cute and works well with Timon and the other animals in the environment." Drawing inspiration from the voice talent helped a lot. 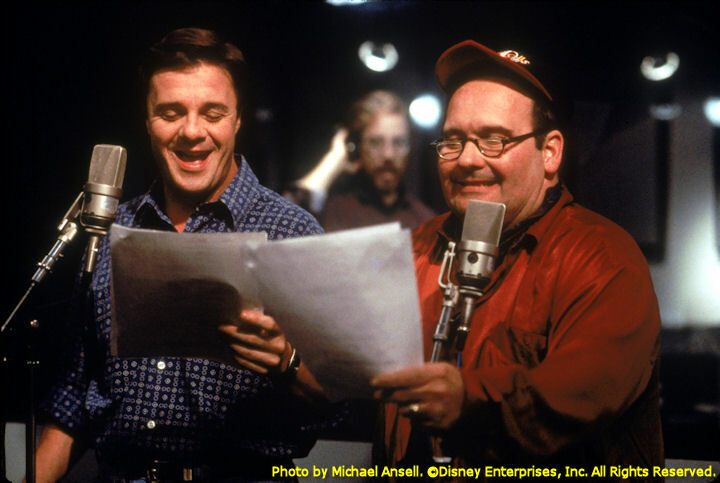 Pumbaa and his meerkat buddy Timon were voiced by Ernie Sabella and Nathan Lane, who, in the early 1990s, appeared together in a Broadway revival of Guys and Dolls. Bancroft and Timon animator Mike Surrey made a trip to New York to see the acting duo in action. "It was a great education for me to see Ernie performing, to study his movements and actions," says Bancroft. "Then, when I got back to my animation desk, I would try to incorporate Ernie's acting style in my scenes. I think it really helped in bringing the character to life." 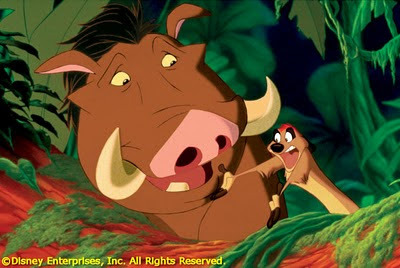 Bancroft and Surrey would continue to be influenced by Broadway musicals as they worked on Pumbaa and Timon. As Bancroft explains, "Mike and I shared an office together and (we) would listen to the music out loud all day long. We would sing along to Les Miserables or Miss Saigon while animating our characters. Maybe it helped in animating our characters singing "Hakuna Matata," I don't know. When The Lion King was finally released in 1994, it was embraced by moviegoers and critics alike, taking in over $40 million during it's first weekend of wide release. It would eventually rack up over $300 million in the U.S. during its initial run and become one of Disney's best loved films. "We had no idea that The Lion King would become the phenomenon that it has become," says Bancroft. At the time, we thought it was just this fun little film with a quirky story about a lion cub in Africa that thinks he killed his father and has bug-eating friends, set to music by Elton John. Not the normal Disney story, for sure. It still amazes me that it is so well-loved around the world." And now, 17 years later, The Lion King is being retooled in 3D for theatrical and home video release. What does Bancroft think about the new look? "When I first heard that The Lion King was being made into a 3D version, I must admit I was skeptical. I wasn't sure what the technology would bring to our 2D animation. Then I saw it and I was amazed at how it looked in 3D--how much it enhances the animation. When we created the film in 1994, we tried to make it as dimensional and real as we could with the technology during that time, but now with stereoscopic technology it actually fully realizes the potential of what were trying to make. I think it actually improves the film. "Look at the wildebeest stampede scene for example. We made the wildebeests in CGI and lowered the camera down to the level of Simba so that the audiences feel the fear of the little lion cub as they rush past him. In 3D that scene literally leaps out at you and makes it all the more frightening for little Simba. That alone is an improvement on the storytelling and a great reason to have this new awesome version." Bancroft learned his craft in an era of hand-drawn 2D animation, so he tends to favor it over modern CG animation. Still, he feels there's room for both styles in film making as long as they're executed properly. "So much has changed in how we make movies in animation," he says, "and yet so much has remained the same. The essence of making animated movies is still about taking the audience on a magical journey to a place they have never before seen through the eyes of characters that are appealing and endearing. I think The Lion King is the best example of that." Roy Williams and Cubby O'Brien on The Mickey Mouse Club (1955). Guy Williams on the TV series Zorro (1957-59). Roger Rabbit maquette from Who Framed Roger Rabbit (1988). She's not bad. She's just molded that way. Jessica Rabbit maquette from Who Framed Roger Rabbit. It's DIIIIIP!!!! Dipmobile model from Who Framed Roger Rabbit. and Joanna Cassidy (Dolores) in Who Framed Roger Rabbit. The Rocketeer (1991). Disney will release the film on Blu-ray on December 13. Cirrus X-3 jet pack from The Rocketeer. from Alice in Wonderland (2010). and Mia Wasikowska in Alice in Wonderland. Props from National Treasure: Book of Secrets (2007). The Dead Man's Chest from the Pirates of the Caribbean movies. Davy Jones' spyglass, pipe and cane. Captain Jack Sparrow's compass that doesn't point north. Orlando Bloom (Will Turner) in Pirates of the Caribbean: At World's End. Costume worn by Jeff Bridges (Kevin Flynn/Clu) in Tron. Display of vintage Mickey and Minnie Mouse stuffed toys. The original Mickey Mouse watch made by Ingersoll in 1933. Mickey Mouse maquette from The Brave Little Tailor (1938). Mickey and Minnie Mouse Handcar manufactured by Lionel in 1934. 1976. I still own one myself....and it still works. 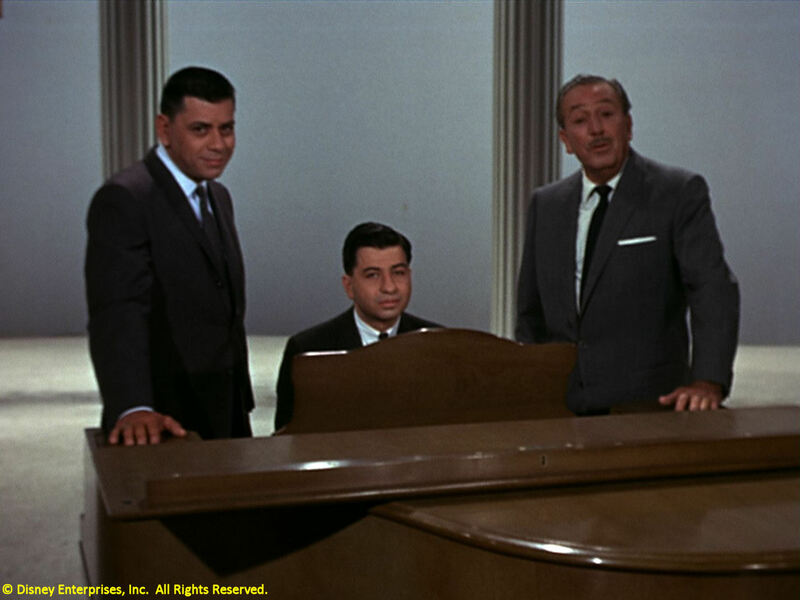 If you follow The Mouse Castle, you know we've been supporting the campaign to have the Sherman Brothers recognized by the the Kennedy Center Honors. The new honorees were announced yesterday, and although this year's recipients are quite worthy of the recognition, the Sherman Brothers are not among them. My father and I were traveling in Scotland for the passed [sic] two weeks and there was very poor internet reception where we were staying. I just read the news that the Sherman Brothers were not among those to be receiving Kennedy Center Honors this year. I was disappointed as I'm sure you must have been as well. But I want to thank each of you who took the time to write letters and helped with our grassroots campaign. I was able to speak with two of the board members of KCH and they said that we definitely have their attention for next year. In January, with your help, I would like to double efforts to try to see if we can get this. Again, though, thank you to everybody who wrote letters, posted blogs and spread the word! Please keep those letters for next year! The campaign continues. We will reconvene in January. At last month's D23 Expo in Anaheim, I paid a Saturday afternoon visit to the MiceChat booth in the exhibit hall. For several years, I wrote quite a bit for MiceChat and stayed pretty active on its message boards. As I devoted more time to my own blog, I became less involved with MiceChat, but stayed close to the people who ran the site and many of its members. I count MiceChatters among my closest friends. OK, forget friends, these people are my chosen family and I'm very lucky to know them. As I stood chatting with MiceAge blogger Al Lutz, Dusty Sage, who runs MiceChat, suddenly got my attention. "We can get five minutes with John Lasseter, but we have to hurry. Can you come with me?" Dusty needed a photographer and couldn't get a hold of his partner Norm, who usually does the camerawork. No need to twist my arm. When you get a chance to meet with Disney/Pixar's chief creative officer, you go for it. With my Nikon in hand, off we went. Our friend Christi went along with us--for interview purposes, we decided she was our assistant--and later, Norm caught up with us as well. D23's Steven Clark probably raised an eyebrow when he saw this MiceChat entourage invade the interview room, but we were all allowed in and were joined by five or six bloggers from other Disney fan sites. Lasseter came in a few minutes later, having just finished a panel discussion with his Pixar creative people, including Andrew Stanton and Pete Docter. Lasseter was friendly, outgoing and generous with his time. Five minutes quickly turned into 45 as we all asked him questions and talked about Pixar, Disneyland and the massive expansion of Disney California Adventure. This wasn't an interview. This was a friendly conversation with a guy who's as big a Disney geek as the rest of us. When it was all over and we shook hands and said our goodbyes to Mr. Lasseter, still pinching ourselves from the opportunity, Dusty asked me if I'd write the article for MiceChat. My conversation with John Lasseter: http://micechat.com/forums/features/158750-micechat-interviews-john-lasseter.html. I've set up a new fan page on Facebook for readers of The Mouse Castle. If you already follow me via Tim's Disney News Archive, it's really just a name change. But, since Facebook won't allow fan page names to be edited, we have to start from scratch, so please visit The Mouse Castle on Facebook at www.facebook.com/themousecastle and "like" the page. Thanks! 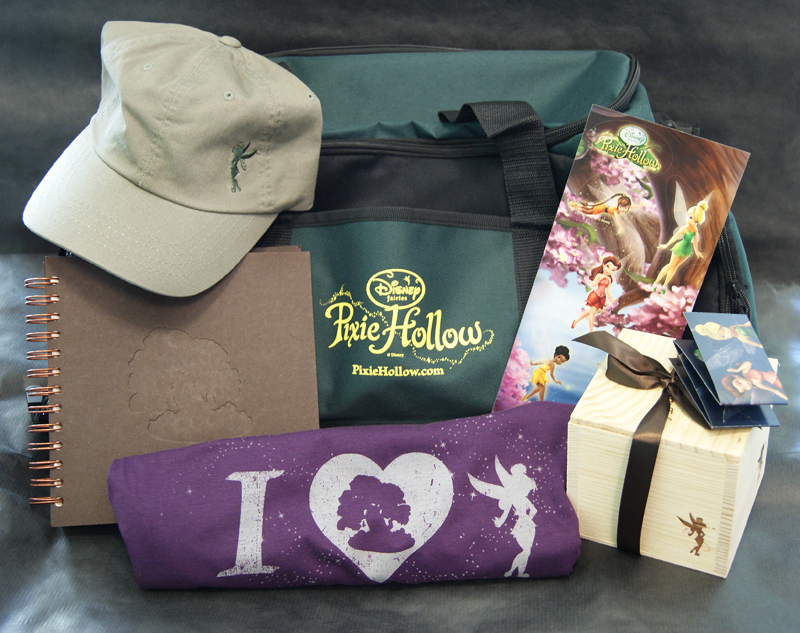 Oh, and did I mention you could win some free Disney swag too? Join our fan page, then "like" the new Mouse Castle logo I posted there and you'll be entered in a drawing to win a Pixie Hollow prize pack from Disney. Entries must be received on The Mouse Castle Facebook page no later than 5:00 p.m. Pacific time on September 10, 2011. Only one entry per person, please, and you must be a U.S. resident. The Mouse Castle giveaway is done in conjunction with Disney's Pixie Hollow "How Will You Train? Art Contest." Disney is giving away a flat screen TV, Blu-ray player, a Disney Fairies DVD/Blu-ray collection and other fun Pixie Hollow prizes. Disney's contest ends on September 6, so there's still time to get your entry in at http://pixiehollow.go.com/contests_home.html. Thanks for being a loyal reader of The Mouse Castle and good luck!